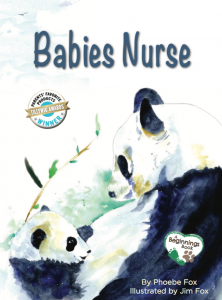 WASHINGTON, DC, UNITED STATES, September 17, 2018 /EINPresswire.com/ -- Platypus Media announces the release of a stunning new children’s book, Babies Nurse, by Phoenix author and elementary school librarian, Phoebe Fox. 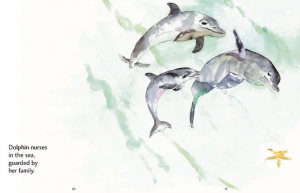 The author’s father-in-law, former NBA star Jim Fox, created the vibrant watercolor illustrations to capture a child’s attention and introduce the most natural and loving of activities—mothers nursing their young. Rhythmic text and engaging facts provide parents, librarians, educators, and healthcare professionals with new ways of sharing the importance of breastfeeding. 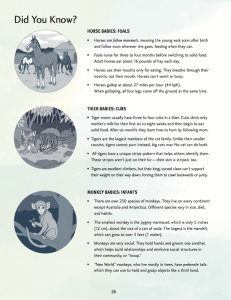 The back matter extends learning with pages of fascinating animal facts and key words. This book serves as a springboard to introduce natural science concepts such as habitats, biology, survival instincts, and classification. The accompanying Teacher’s Guide extends the book’s effectiveness. Written by Paola Segnini, ESL teacher and La Leche League leader, the Guide includes additional content, vocabulary, hands-on activities, and games to develop cognitive skills, teach science concepts, discuss breastfeeding, and improve literacy. It is available for free download at PlatypusMedia.com. Así se alimentan los bebés, was released in June 2018 to much acclaim. It has already won a Tillywig “Parents’ Favorite Products” award and was recommended by Foreword Magazine and Kirkus Reviews. Babies Nurse can be purchased in a two-book set with another new release, Cuddled and Carried. Together, these books about care and bonding create a foundation for healthy growth, introduce science topics, and promote breastfeeding and attachment. Both titles are part of Platypus Media’s new Beginnings collection. Phoebe Fox wrote this book to show children the warmth and beauty of nursing. To ensure this book directly supports breastfeeding promotion, she arranged for a percentage of the profits to be donated to La Leche League, International. This is her third book. Fox lives in Phoenix, Arizona with her husband and their three sons. She can be reached at PFox@PlatypusMedia.com. Jim Fox makes his artistic debut with Babies Nurse. He is retired from the NBA, where he played most recently for the Phoenix Suns, and now enjoys creating watercolor art. Father-in-law to Phoebe, and grandfather of five, Jim lives in Phoenix, Arizona. Contact Jim at JFox@PlatypusMedia.com. Platypus Media is an independent press that creates products with a broad appeal to diverse families who believe in the importance of close family relationships for the full and healthy development of children. The publisher is committed to the promotion and protection of breastfeeding, and donates a percentage of profits to groups that work in this field. Platypus Media products are available for direct purchase. They are distributed to the trade by National Book Network. Library bound editions are available from Children’s Plus. Review copies available upon request. Sample pages, cover scans, and Teacher’s Guide available at PlatypusMedia.com.